This morning, along with 30,000 other runners, I registered for the Broad Street 10 miler. The website wouldn’t load, I lost the information I entered more than once, I got stuck on pages that told me the service was unavailable or illegal. But, in a fury of determination and annoyance, I hit the refresh and back buttons approximately 3,293,812 times, which seemed to be obsessive enough to get me in before the race sold out. In less than six hours. Last year, the same race sold out in four days. The 2012 Chicago Marathon recently sold out its 45,000 spots in six days, compared to 31 days a year ago, and 35 weeks a decade ago. In the fall of 2010, registration for the 2011 edition of the Boston Marathon (25,000 spots) sold out in 8 hours. I registered for that race and can tell you the feeling was much the same as this morning – locked screens, entry forms being erased, moments of panic. The prediction for that race was that it would close in two weeks, but it took eight hours. What’s the deal? One obvious reason is more people are running than ever before. Participation in long distance events continues to increase. In 2002, 325,000 people finished marathons; in 2010, 503,000 people did. But another reason is the Tickle Me Elmo Effect: when we know everyone else wants something, we trample each other to get it. When you add in runners—a group of people who by their very nature are prone to wanting to beat others to a finish line—and tell them there’s a chance they will miss an opportunity if they stall, they will jump on it. With the popularity of Twitter and Facebook, it has only gotten worse. Without fail a few days before a popular race I see multiple tweets about the likelihood that the race will close, which only makes me want to run it more. 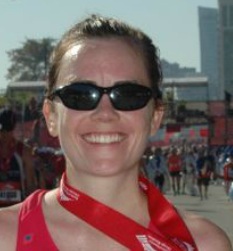 Honestly, when the Chicago Marathon was filling up in record time I thought, oh man, I might miss that opportunity! But I don’t even want to run Chicago this year. The Boston Marathon tackled the situation by decreasing the qualification time by 5 minutes and making registration a rolling admission. The new process debuted for this year’s race and seemed to go smoothly. I like the solution of setting harder standards—this is the quintessential race you have to qualify for. Make it harder and people will rise to the occasion. The thing I don’t like is the rolling admission. Rolling admission means you can finally get your Boston Qualifier (BQ) and still not get in, because you qualified with a 3:25 and people with a 3:15 get to sign up three days before you. (This doesn’t sound too much better than a frozen computer screen.) To me, that makes the BQ standard slightly meaningless. If the standard is a 3:35 and you beat that, you have just as much right to be there as a 3:15 runner. But what about races that don’t have qualification standards? Should they adopt them? I don’t think so. I love Boston because it stands out in that regard, but I love all other marathons because anyone willing can sign up and tackle the distance. Hugely popular races like the NYC Marathon and the Cherry Blossom 10 Miler have lottery systems. You sign up within a certain time frame (generally a few weeks), and they literally pick your number randomly. (The Broad Street 10 miler is giving away a few more spots in this way over the next few days.) For NYC you have about a 1 in 10 chance. There are ways around this—raising money for a charity, running a certain qualifying time, having run every NYC for 15 consecutive years, or getting rejected three years in a row (though they recently made even these standards harder because it encompassed too many people!) A race like the NYC Marathon is a once in a lifetime experience, and I encourage you sign up for the lottery and try your luck. But it’s unsatisfying. As runners, we make our own luck; we work hard, we see results. Lotteries and games of chance aren’t appealing. What’s left? It’s unfeasible to make races larger. Most races are capped because of the nature of the course, start and finish areas, and the length of time roads can be closed and police can be present. For example, the Boston Marathon is significantly smaller than NYC or Chicago, in large part because the road the race starts on is incredibly narrow. Squeezing 25,000 people through, even in three waves that take over an hour, is difficult enough. Honestly, I don’t have a solution. If you have any thoughts, leave a comment below, or contact a local race director – they are desperate for new ideas. In the meantime, it might be useful for everyone to calm down a bit and try not to freak yourself and others out. Of course, I’m being hypocritical saying that, as I’ll admit to writing multiple emails to friends and family yesterday saying to register early. And when the next race comes around, I’ll be right there with you, overloading the website.